Despite the name, this is one year-round neutral palette. 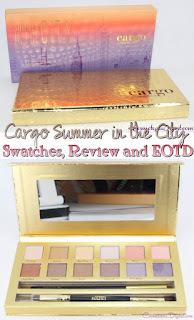 From the external box, I expected the Cargo Cosmetics Summer in the City palette to contain summery oranges, warm beiges, ruddy browns and a bright or two. Wrong. It is a very gold-centric palette and the packaging reflects that as well. 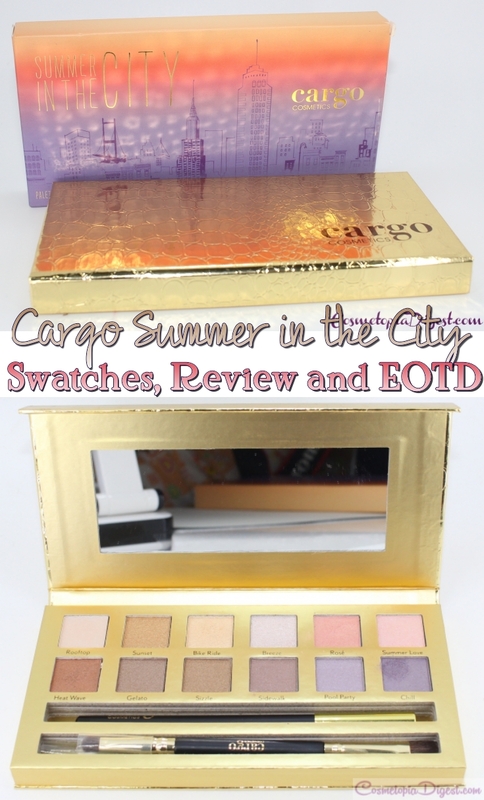 Scroll down for swatches of the Cargo Cosmetics Summer in the City eyeshadow palette, and for an eye makeup I did with some of the shades. Cargo has some of the best packaging ever. The palettes may be cardboard, but you have to love the design. My first Cargo palette, Let's Meet in Paris, reviewed and swatched here, features a baroque pattern. This one has a colourful external box which reflects the Summer sky in NYC. The faux croc gold palette is sturdy and has a magnetic closure. Inside, you get a double-ended brush AND an eyeliner. That is the best way of pleasing everyone. The brush will do at a pinch while the eyeliner is pigmented and creamy. The 12 eyeshadows are inspired by the Summer days and nights in New York. For me, this palette is very gold-centric, with pale and medium golds and golden browns. If you are fed up with tricky eyeshadow formula - dryness, chalkiness, fallout and so on - you will love this palette. You can diggy-diggy-dig but get no fallout, except on one shade. You can get serious colour payoff in one swipe. Plus, the eyeshadows are soft and smooth to touch and the colour glides on comfortably. It has been a while since I said this about a palette. Downside? If you are a matte fan, this palette is not for you. Everything is shimmery, although without chunky glitter. Rooftop (pale pink shimmer): Pale beige shimmer on me. Sunset (gold shimmer): Agree. Pure gold. Bike Ride (pale gold shimmer): Ditto. Breeze (ivory shimmer): More silvery white on my skintone; probably ivory on pale people. This is the only shade I dislike in this palette. Rose (peach shimmer): Rosy peachy with a slight duochrome effect. Huge love! Summer Love (pink shimmer): Pale pink shimmer on me. 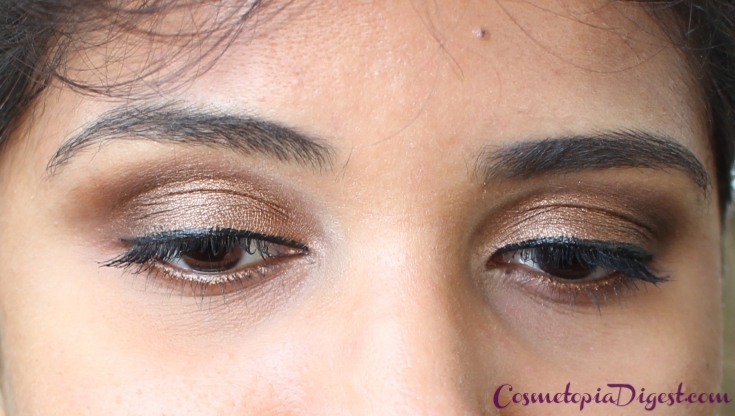 Heat Wave (copper shimmer): Copper, yes, but with slight golden undertones. Gelato (medium brown shimmer): Bronzy shimmer. Sizzle (bronze shimmer): Medium golden brown shimmer. Sidewalk (deep brown shimmer): Agree. Pool Party (light lavender shimmer): Yep. Chill (deep lavender shimmer): On the sheer side. The only shade with a bit of fallout. Swatches are all on bare skin, in natural light. Rooftop to Summer Love are on row 1; Heat Wave to Chill are on row 2. I did this eye makeup look using Sizzle on the eyelids, Gelato in the outer corners, Sidewalk in the crease and Rooftop as a mild highlighter. I also applied Sizzle on the lower lashline. This is over my favourite Kat von D Highvoltage Eye Primer and alongside Makeup Revolution black liquid eyeliner. I am usually a matte-shadow person, and I thought I had pretty much all the neutral palettes I "needed", but this beautiful, gold palette proved me wrong and captured my heart with its soft, shimmery shades. Best of all, despite all the shimmer, there is surprisingly little fallout, except on Chill. I love how Cargo has maintained the quality over the years whereas several brands seem to have lost the plot and kick up a lot of dust with their recent shadow formula. Need it? If you don't own too many golds - such as Lorac Unzipped Gold - certainly. Though not a typical Summer palette - and certainly having little to do with New York apart from the design on the external box - this would make a nice end-of-the-season treat for yourself or for someone special. The Cargo Summer in the City Palette is available on Ulta here for $34. For international customers, you can get the palette here. They now have a free gift offer of Cargo single eyeshadow in Pasadena when you purchase the palette! Loved any neutral palettes recently? Which one? Tell me in the Disqus comments widget below. * May sound misogynist to some, but the poem is question is "Ode on the Death of a Favourite Cat Drowned in a Tub of Goldfishes", if you want to know the context.